You’re about to be amazed at the drugstore game strategy I’ll share with you to get your favorite, brand-name toiletries for pennies on the dollar. Have you ever heard of the drugstore game? You know, where you walk into a drugstore (CVS and Walgreens are the two main ones) with some coupons + a strategy, and come out with loads of products, but just a few bucks lighter in the wallet? People can get a little crazy with the drugstore game, especially in their first few months (I know I did). It can also seem a little overwhelming at first. But I guarantee you that if I figured it out, then so can you! Your savings will be almost immediate – how’s that for some instant gratification? After a few months you will be great at it and it will prove to be a wonderful money saving tool in your frugal living arsenal. How Does the Extra Bucks at CVS Work? How Do I Use my CVS Card? What are Some CVS Coupon Scenarios? How to Use CVS Extra Bucks to Get the Most for Your Money – CVS Extra Bucks, How Does it Work? Can You Play the Drugstore Game WITHOUT Using Manufacturer Coupons? Sign up for the CVS Rewards Card: Don’t have one of those CVS red cards yet (the Rewards card)? Definitely sign up for one, and have them scan it for every single transaction that you make. Sign up for Health Rewards: You can earn up to $50 in ExtraBucks Rewards per year for prescriptions that you fill. The catch is, you have to manually sign up for it first. For each 10 prescriptions you fill, you’ll earn $5 in ExtraBucks Rewards. Join the ExtraCare Beauty Club: Join this club, and for every $30 you spend in beauty products, you’ll get $3 in ExtraBucks Rewards. This is on top of any ExtraBucks Rewards earned through weekly deals while buying the individual beauty products as well. The best thing about this club? They include all kinds of items as “Beauty” products – so even if you don’t regularly purchase nail polish or other makeup, you’ll likely reach the threshold. You’ll also get both a welcome gift, and a birthday gift! Get CVS Coupons in the Mail: You definitely want to receive CVS store coupons in the mail – they are wonderful. Ever wondered how to get CVS coupons in the mail? You need to sign into your account, and then add your name to the ExtraCare mailing list. Boom! Scan Your Card at the CVS Coupon Center Machine: Most, if not all, CVS stores have a Coupon Center. It’s a clunky red machine where you scan your ExtraCare Rewards card into (you’ll want to do that each time you visit, before you make your transaction), and it spits out specific coupons just for you to use! These are gold. And, to be honest, it’s kind of fun to see what you can get. Quarterly Earnings on (Almost) All Purchases: Each quarter, CVS boosts your ExtraCare Rewards by tallying up all that you’ve spent in the last three months, and (with a few exclusions) giving you 2% back in the form of ExtraBucks. How cool is that? These will either print out on the bottom of your receipt after you purchase something on (or right after) January 1st, April 1st, July 1st and October 1st. You can also scan your CVS card at the Coupon Center and get them printed out upon entering the store. Sending Savings and Rewards to Your Card: Did you know you can get CVS coupons and your Rewards sent right to your CVS card? You’ll want to sign up for the email offers, and then you can choose whether or not to print or send those emailed offers electronically to your card. The drugstore game is a shopping strategy – on steroids, that is. It’s maximizing your resources (store coupons, manufacturer coupons, ExtraCare Rewards/Balance Rewards, and sales) to get products for pennies on the dollars. It’s really a timing game, and one you can win with the resources I’m about to share with you. The Drugstore Game allows us to beat the retailers at their own game by using THEIR sales, coupons, and terms to our advantage. The rules are simple, but the strategy takes a few tries to put into play. That’s what I am here for: to walk you through the strategy and to help you save hundreds and even thousands of dollars every year on your name-brand toiletries (shampoo, deodorant, lotion, toothbrush, toothpaste, razors, etc. ), over-the-counter (OTC) medicines, makeup, and so much more! I know it can be done, as my husband and I have gotten roughly $2,800 in free products over the last several years playing this game. In fact, I have so much product left over from playing the drugstore game that I donate bags of toiletries several times a year to a women’s domestic abuse shelter here in Houston! Let’s get going, with first learning about how ExtraBucks rewards works and what you are/are not allowed to do. 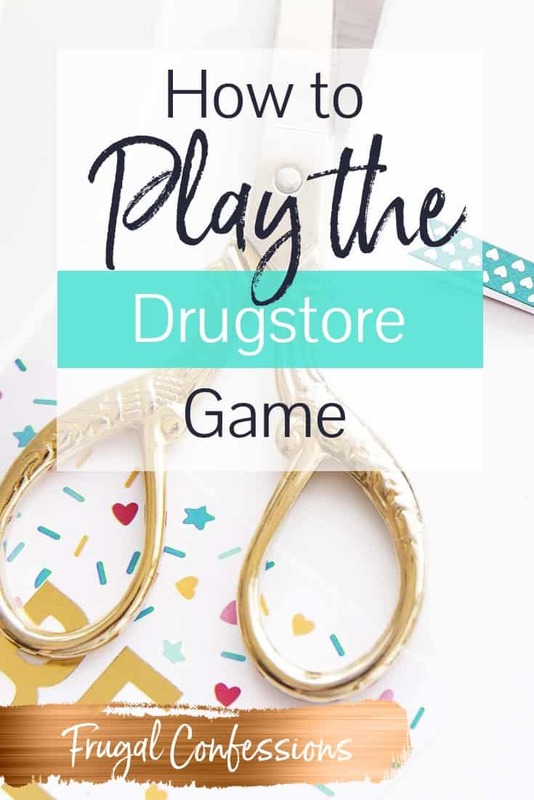 Note: While you can technically play the Drugstore Game at any of the large drugstore chains (CVS, Walgreens and Rite Aid), we are going to focus on playing the game at CVS only. This is because after four years of doing this, I have learned that it is the easiest to play at CVS versus the other drugstores. First up, how does the Extra Bucks at CVS work? You’ll need to know, as that’s a huge component to this drugstore game. CVS treats ExtraBucks almost like cash. The secret sauce to this whole strategy: You can “roll” your ExtraBucks. In other words, you use ExtraBucks to pay for products that will also earn you ExtraBucks. And then you continue doing that, over, and over, and over again. Next up, you’ll want to know how to use your CVS Card. Sign Up for Your Online Account: Not only will you be able to shop online, but you’ll get emailed offers (plus you can sign up to get coupons in the mail), you can join the beauty club, and much more. Scan Your Card into the Coupon Center: Upon entering any CVS store, always scan your card into the coupon center (the big, red, clunky machine). You’ll get deals on the spot that you might be able to use in your next transaction, not to mention periodic printouts of your quarterly ExtraBucks Rewards. Scan Your Card Before Each Transaction: It’s important to have your card out and handy (you can also scan the keyring card you’ll get upon program sign-up, or even scan your card through CVS’ app). Next Up, we’ll learn about stacking coupons. Coupons are wonderful! But not if you’re only saving $0.35 off a can of soup, or $1.00 off a full-priced tube of lip gloss. You’ve got to make each of your coupons count for MORE, and there are simple ways to do that. You can stack your coupons. This means, don’t JUST use a manufacturer coupon on a product. And don’t JUST use a store coupon on a product. Heck, don’t even JUST use ExtraBucks rewards on a product (it’s important to note that ExtraBucks aren’t seen as coupons to CVS, but rather as cash). That’s right – you want to use a manufacturer coupon, plus a store coupon, plus ExtraBucks rewards on a product that is on sale (and that will yield you ExtraBucks rewards – but we’ll get into that in a moment). Do you see how much more powerful a discount you can get when you stack all these things on top of each other? And it’s totally allowed by CVS coupon policies. I’ll show you an example transaction for how this works in two scenarios below. See the incredible difference that rolling your ECBs can make? The person who did the unlimited scenario paid $7.06 less than the person who did the limited scenario, yet reaped so many more products (a total retail value of $21.16 + tax) as well as free CVS money to spend on a future transaction. The person who did the limited transaction got the items that they needed, but spent a lot of hard-earned money for them and could have just shopped their home stockpile for these items if they had been playing the Drugstore Game all along. Each week, CVS prints a sales flyer filled with all of the items in play for that week. Some items are on sale, while other items are on sale and offer an added bonus: you will earn ExtraBucks® (ECBs) on the purchase. This means that if you purchase this item you will receive CVS dollars (ECBs) printed on the bottom of your receipt at the cash register (or in the form of a gift card called CVSCash cards—more on this later). These ECBs can be used just like cash at a CVS to pay for part or all of any product that you wish to purchase in your next transaction. But you probably knew all of this, right? The secret is in taking this a step further by rolling the ECBs. In other words, you use ECBs to pay for products that will also earn you ECBs. You continue that trend…ad infinitum. Your goal should always be to use the ECBs you earned from your last transaction, to buy something in the next transaction, which will earn you the same amount or more in ECBs than you spent. You need a few resources to play the drugstore game, so let’s get you set up right. Discounted Newspaper: You’ll need to source manufacturer coupons, and the Sunday paper is practically a gold mine for this. Here’s a link for where to order a discounted newspaper subscription (paying full-price for anything is overrated! So is scrambling to find a newspaper every Sunday morning – getting it delivered is just smart strategy). CVS ExtraCare Card: You’ll need to sign up for the ExtraCare rewards program, and get your very own CVS rewards card. A Comprehensive Guide to the Game: I’ve given out tons of info + tips for how to play the drugstore game here – you can be mighty successful with what you’ve learned. But there’s more to learn that couldn’t be fit on this page, and I’ve compiled it into a comprehensive eBook. You can get a copy here. Let’s put all this learning together into an actual strategy – The Drugstore Game Strategy. Get Your Hands on (Discounted) Sunday Paper: You will need to get a set of coupons (at least one set, more is preferable but not necessary) every Sunday. Get creative at finding coupons in places other than the Sunday Paper: do you have neighbors who get the Sunday paper but hate couponing? My friend finds a ton of coupons in recycling bins. Many libraries have coupon exchanges, and you can set your own up at work or amongst friends. Here is a great place to get a discount on a newspaper subscription. The money you spend on a subscription will be peanuts compared to what you save. Organize Your Coupons (RE: Don’t clip them all! ): I don’t mean clip them all (heavens no—that would take too much time, though some people do this). Instead keep them filed. Purchase ten folders or so and write the date of the inserts on the outside in a sharpie marker. You’ll see why this is necessary and time-saving in a moment. Follow a Drugstore Game Blog: There are women who stay at home and do nothing but track deals all day. How great is that for people like you and me? Each Sunday when the new CVS, Walgreens, and Rite Aid flyer comes out, simply click on one of the following blogs and read through their write-up on the deals. They will list out the sale, and then also pair it with a coupon (with RP for Red Plum insert, SS for Smart Source insert, or PG for the PG insert) and a date. Go to your folders, look up the date, clip out the coupon, and voila! The blogs I turn to for this information are: Money Saving Mom, Coupon Mom (sign up for a free account and you can search her database to find a coupon by brand), and I Heart CVS. Go Shopping: Write down the deal (or circle it right on the flyer), and go shopping! When you come out of there having paid less than a dollar for $40 worth of merchandise, the sales clerks and probably the person behind you will be asking for your phone number. Confession time: I stopped receiving the Sunday paper sometime in 2013. The back story: since I'm an unpaid featured blogger at the Houston Chronicle since 2009, I thought that perhaps I could get a free subscription to their Sunday paper and keep the coupons rollin' in exchange for my writing. They thought so too, and so they worked on it. And worked on it. And worked on it. We got a ‘late payment' notice in the mail, then another one, and finally the nice folks at the Chronicle stopped answering my emails because they couldn't figure out how to tweak their system to give me a free subscription. Frustrating to say the least, but so it goes sometimes. Then my husband lost his job, and so I didn't want to add any extra expenses onto our household, so I decided to not re-up our subscription for how to save money. So why am I blabbering on about the Sunday paper at all? Well, the great news is that it gave me the opportunity to attempt to play the Drugstore Game without the help of manufacturer coupons. And since this is the Numero Uno reason for why people tell me they don't want to play the Drugstore Game — which will save them hundreds and thousands of dollars on their toiletries — it became the perfect opportunity to show what's possible without clipping! First, I'll outline how I played the game. I still used all the principles of the CVS Drugstore Game, as outlined in my fabulous + cheaply-priced eBook. This means that I still used coupons. However, I only used coupons that were directly given to me by CVS itself. CVS generously disperses coupons to its cardholders with the same consideration as medals at a preschool field day. Every time you turn around, there are coupons coming at you in emails, from the Coupon Center at the store, on the bottom of your receipts, in the mail, etc. Here's what was included: 2 Colgate Total White toothpastes, 1 bottle of Listerine (500 mL), 1 playtex feminine product, 3 Dial soap 3-packs, 1 Speedstick deodorant, 3 Scott tissue 12-packs of toilet paper, 1 Palm Oxy Power dish soap, 1 Irish Spring soap 6-pack, 2 Softsoap body washes, 1 Irish Spring body wash, 1 Gillette Fusion razor, 5-count pack of Gillette Fusion refills, 1 Nexium 42-count medicine, and 1 Sponge Bob Square Pants pack of Band-Aids. To get this, $20 even (including taxes) came out of my pocket. Impressive, right? I mean, I even managed to impress myself (and I've been playing this game since 2008, with savings of close to $3,000 for my two-person family). I've been convinced that I couldn't play the Drugstore Game in a way that makes it worth it without that Sunday paper, but I've totally proven myself wrong. And I hope I've shown you what's possible with what you have right now as well! Here’s a coupon to get started playing at CVS.com ONLINE!